This is the fourth and final installment from my thesis for the Upaya Buddhist Chaplaincy Program. In the first post, I covered the context and background of the Protest Chaplains as well as the Occupy Wall Street Movement. In the second post, I shared the findings from my interviews with four of the chaplains. In the third post, I explored five lessons distilled from studying the Protest Chaplains. This last post is the conclusion to my thesis. Most of it is devoted to a long quote from one of the original Protest Chaplains, Marisa Egerstrom. I was so taken by her words that I felt it was important to give voice to the whole quote. If you’d like a copy of my entire thesis (complete with references), just drop me a line at maia.duerr [at] gmail [dot] com. 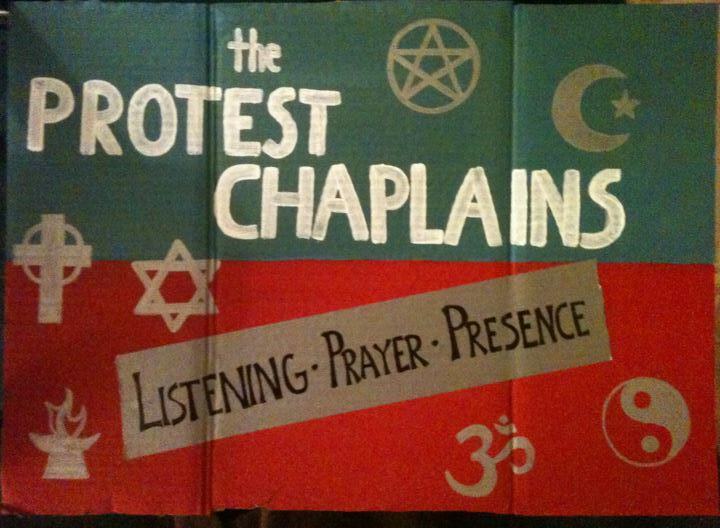 During the fall of 2011, the Protest Chaplains served as a living example of chaplaincy as a vehicle of not only personal change but of social change as well. This can only be possible, however, if in addition to all the other basic qualities a chaplain should possess, he or she has a working knowledge of systemic suffering and systems change, and is willing to look at his or her own privilege in the context of social inequity and injustice. [This experience with Occupy has] planted in me the conviction that true pastoral care IS revolutionary, in the sense that so much of what people experience as depression is a cognitive recognition of the overwhelming reality of just how out of balance, how unsustainable, and how unjust Life As We Know It actually is, without the emotional/psychological/spiritual capacity to deal with that reality. It’s a tall order, and I don’t think any of us really have that mastered, because, hey, samsara is what it is. But then, that’s the whole reason for the Protest Chaplains experiment. I constantly call on clergy to help move people through the transition from denial to recognizing that our government, the police, etc., are not, actually, there to protect or help us, but to defend the concentration of wealth. It’s a terribly difficult thing for people who have been pretty comfortable their whole lives. But ordained or lay, whatever tradition you’re in, if you’re not helping people cope with this and find hope in a sense of the goodness of God who is alive in us or whatever your equivalent is, I am now convinced that you are only an agent of illusion. Maybe that’s harsh, but I’ve seen too much in the last three months to deny it. The whole “wake up” paradigm is kind of cliche, and yet it’s still entirely apt. And believe me, I wish it was otherwise. Crying has become an integral part of my own spiritual practice. It kind of has been accidentally, but I’m more intentional about it now. Real grief is one of the most healing powers I know. And it’s actually a strategy of psychologically breaking down detainees in Guantanamo to keep them from crying. If torturers understand that crying is emotionally necessary in times of stress, then I’m going to cry as often as possible. So I hope that the experiences of the Protest Chaplains, as we bring stories of our experiences out into various faith communities, will spark a new theology of grief and powerful hope that overcomes the denial-laden pseudo-optimistic think-happy-thoughts crap that so often passes for spirituality in numb, consumerist America. Then again, I’m a Christian, so I’m somewhat accustomed to the idea of the power of failure. I’ve tried to explain this to other Protest Chaplains when nasty stuff has rattled them at camp. We’re going to lose, things are going to get worse, maybe even horrific. Lots of people may die – in fact are dying from hunger, sickness, homelessness – before this chapter of history is over. That doesn’t change what we have to do. And you’re so right – we don’t know. It is being without knowing. I really think it’s been the influence of my Buddhist therapist/teacher/guru/consultant who’s helped me see this. “Anything worth doing is worth doing badly,” he reminds me. So, we’ll show up, and figure it out as we go. And have faith enough to be wrong, to change courses, and to keep looking for life in the midst of the rubble.